Explaining what sprains are and how they happen, with specialized treatment options and rehabilitation to strengthen and protect your ankle. The ankle joint is made of a complex assortment of bones, muscles, tendons, and ligaments. On the medial (inside) side of the ankle, the deltoid ligament prevents the ankle joint from rolling out (eversion). 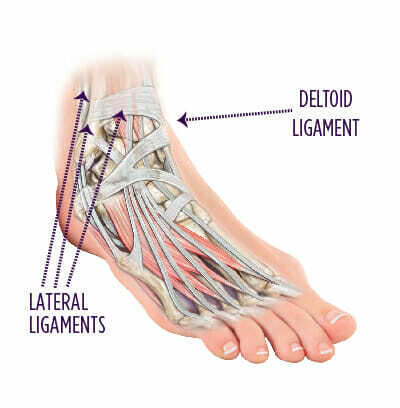 Meanwhile, on the lateral (outside) aspect of the ankle, there are three separate ligaments that prevent the ankle from rolling in (inversion). If the ankle is stressed beyond its normal end range of motion, the ligaments can be sprained. Certain bones of the ankle and foot can become fractured if the injury is severe. Symptoms of an ankle sprain vary in presentation and severity, and this list should only be thought of as a generalization. May be difficult to bear weight on the injured leg, making it painful to walk. The severity of your symptoms will depend on the degree of injury to the ligaments. First-Degree: Stretching of the ligaments without any tearing or significant laxity. Second-Degree: Stretching of the ligaments with partial tearing of the fibers, resulting in mild to moderate laxity. Third-Degree: Complete rupture of the ligaments and significant laxity. A discussion of your symptoms, a physical examination, and X-rays are useful for a diagnosis. Your specialist may also recommend an MRI scan to evaluate for injuries to ankle cartilage or tendons around the ankle that can also be injured during an ankle sprain. What can I expect my results to be after treatment? Once your ankle can bear your full weight, your Summit physician will prescribe exercises to strengthen your muscles and ligaments, and increase your flexibility, balance, and coordination. You may have your ankle taped or in a supportive brace for walking and running. Your recovery time depends on the severity of your sprain. But no matter what type of sprain you experience, rehabilitation is the key to strengthening and protecting your ankle from future injury. Without rehabilitation, your ankle may cause chronic pain and instability, and you may develop arthritis. Let your Summit foot and ankle specialist know if your ankle still hurts even after rehabilitation. They will examine you to make sure the sprained ligament has healed correctly and that there is not some other injury causing problems. To prevent future sprained ankles, stay in shape and maintain good muscle balance, flexibility, and strength in your soft tissues. Pay attention to your body’s warning signs to slow down when you feel pain or fatigue.